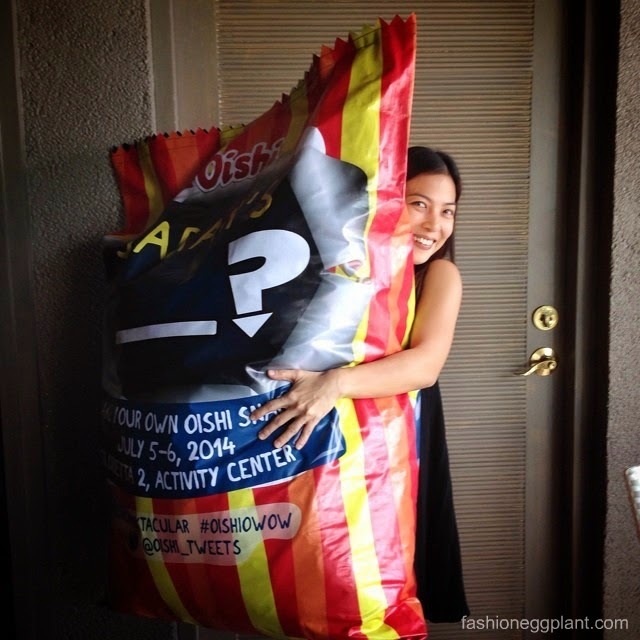 This is my second ginormous Oishi bag so far. Each time I post it on Instagram, my friends go ga-ga.
Oishi was a big part of our childhood and seeing it blown up to these gigantic proportions makes it almost seem like a pop art piece because of its nostalgic/iconic status. Point is, everybody wanted one. I'd get endless queries as to where they can purchase these human-sized bags. 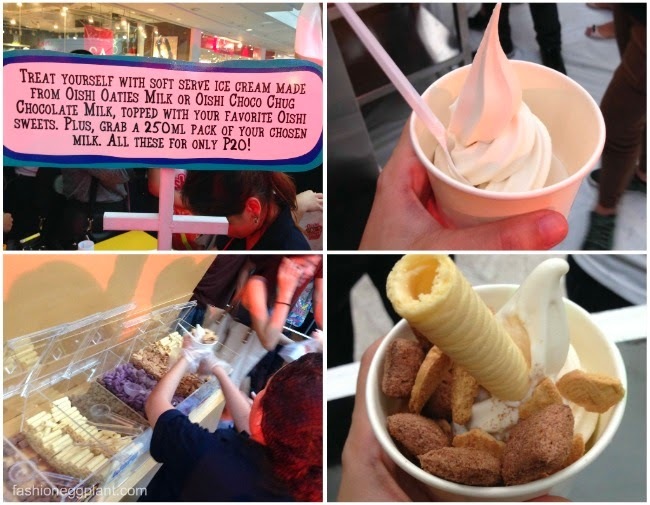 But this year, Oishi decided to make them available to the public with the Oishi OWow Snacktacular event held at the Glorietta 2 Activity Center last July 5-6. I chose the Rin-Bee bag because that was my favorite childhood snack. To keep things fair, we filled it up with Nikola's favorite products, Oaties Milk, Smart C, Cereal and Choco Chug. The Snacktacular bag isn't as huge as the media bag but I think it's as big as it can get while still being manageable enough to maneuver around a crowded mall. Besides, we didn't want to get our hands too full too early on since that was just the first of 3 stations that we could visit that day. Next up was the "Make Your Own Snack Station" where we could design our own snacks and experiment with different flavors just like what Ramon Bautista, Daniel Padilla and Elmo Magalona did. For just P20, we were able to fill up a paperbag filled with an assortment of chips that was later personalized with our names. I left the mixing to Nikola. We ended up with a RinBee/Oishi base with ketchup, cheese and barbecue powder. Finally it was time to head to my favorite station, the Oaties Milk/Choco Chug ice cream station! Aside from getting to stuff ourselves full, Ramon Bautista, Daniel Padilla, Kathryn Padilla and Elmo Magalona also showed up to provide entertainment and laughs. 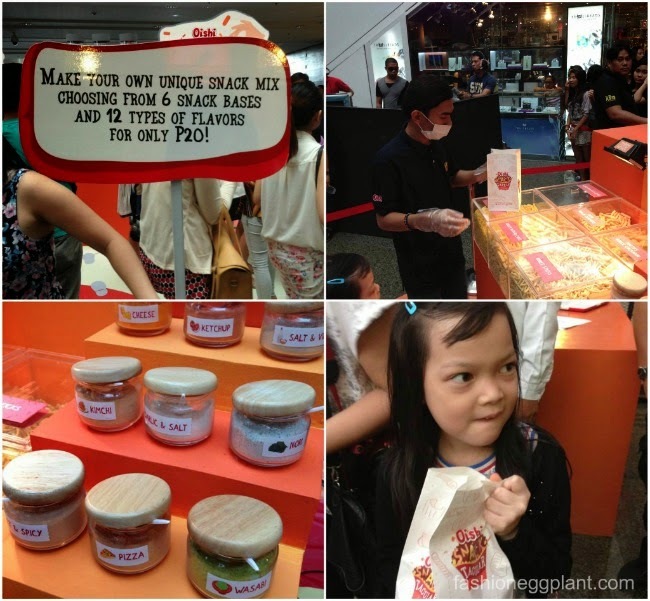 The Oishi Snacktacular event was genius and the execution was flawless. I hope they have another one next year since it's a tradition I'd like to keep. In case you missed it this year, stay tuned and cross your fingers that they'll decide to have another one. Your kids (and yourself) are guaranteed to have a hoot! Had I known I would have gone there..My daughter and I love Wafu!